SEA CUTLERY There are 5 products. 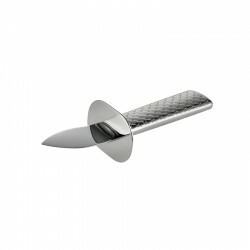 Oyster knife in 18/10 stainless steel mirror polished. Blade in steel AISI 420. Doriana and Massimiliano Fuksas enrich the 'Colombina collection' family with a cutlery set designed for seafood lovers. The handles on each piece have a special texture inspired by fish scales: an evocative pattern that clearly indicates the purpose of this cutlery. 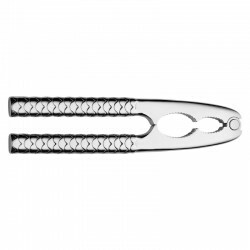 Shellfish forks in 18/10 stainless steel mirror polished. Doriana and Massimiliano Fuksas enrich the 'Colombina collection' family with a cutlery set designed for seafood lovers. The handles on each piece have a special texture inspired by fish scales: an evocative pattern that clearly indicates the purpose of this cutlery. Doriana and Massimiliano Fuksas enrich the 'Colombina collection' family with a cutlery set designed for seafood lovers. 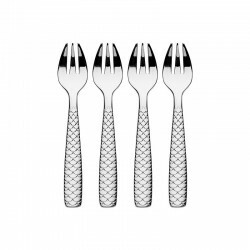 Colombina fish is a complete range of cutlery perfect for serving and enjoying fish dishes. The handles on each piece have a special texture inspired by fish scales: an evocative pattern that clearly indicates the purpose of this cutlery. 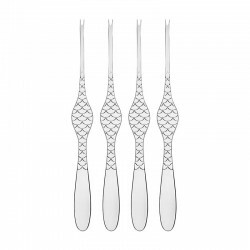 Set of four oyster and clam forks in 18/10 stainless steel mirror polished. Doriana and Massimiliano Fuksas enrich the 'Colombina collection' family with a cutlery set designed for seafood lovers. The handles on each piece have a special texture inspired by fish scales: an evocative pattern that clearly indicates the purpose of this cutlery. 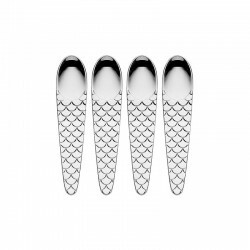 Caviar spoons in 18/10 stainless steel mirror polished. Doriana and Massimiliano Fuksas enrich the 'Colombina collection' family with a cutlery set designed for seafood lovers. The handles on each piece have a special texture inspired by fish scales: an evocative pattern that clearly indicates the purpose of this cutlery.